This entry was posted in Admin, Book, Education, HE, international, Management, University and tagged Administration, Chronicle, HE, international, strategic planning, universities, US by Paul. Bookmark the permalink. I don’t understand your point Paul. If the strategic plan isn’t there to give leadership and determine the allocation of resources and priorities, then what is it for? Pingback: Ninth Level Ireland » Blog Archive » The Strategic Plan: a tool for administrative power? Andrew, I agree with you but unfortunately I don’t think Ginsberg would. 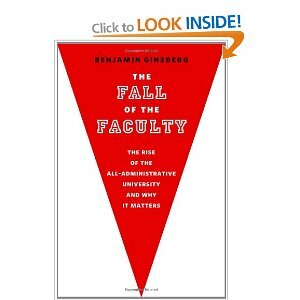 The suggestion from his extract (and my guess is the rest of the book too) is that all of this is about administrators taking decision-making about resources and priorities out of the hands of those who know best, ie academic staff. This is just not my experience of successful strategic planning.